Generally speaking there are 8 face shapes, 9 or 10 if you were trained to include the oblong and pear shapes but for the sake of not confusing those who don't know a lot about face shapes we are going to ignore them (for now) because they are simply too similar to other shapes (I'll let you know which ones so don't fret!). Why do I need to understand my face shape? It's important because most people who wear makeup want to apply bronzers, contour creams or powders, blush and highlights. When you don't understand your face shape there is a chance that you're missing the mark with your application, proper placement of product can transform a pretty face of makeup in to a stunning face of makeup. Being able to identify your face shape will also help you to correct and enhance areas of your face, feel like your jaw line is too square or your chin is pointy? No worries! Wish your cheekbones were higher or more pronounced? Easy peasy! Can we fix it? Yes we can! So what are the face shapes? These are the 8 most common face shapes. The first step to determining your face shape is pulling your hair away from your face in to a ponytail and placing yourself in front of a large mirror. Some face shapes are obvious straight off the bat, some are more difficult and some are a bit of a mixed bag. Having a tape measure, pen and paper handy can help to determine a concise conclusion to your face shape. Now for those who hate numbers I'm sorry, but this is the best way I know of helping someone to understand their face shape. 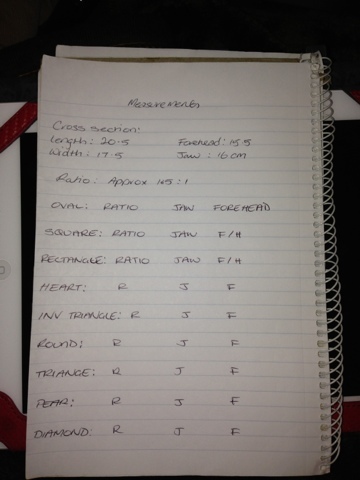 Below is an example of my measurements and how I would recommend writing them out (this will come in handy later). Ok, where should I measure? You should now have 4 measurements, your cross section which consists of 2 measurements (length (1) and width (3)) and the final 2 horizontal measurements (forehead (2) and jaw (4)). Your cross section will fit a ratio (Length : Width). This can also be approximate as you will see in the picture of my measurements above, don't worry too much about this as it's used as a guide, if you're half way between a set of ratios it's ok, you could even write them both down. If your length is more than 1 1/2 times your width then you can jump straight down to the rectangle face shape. Oval: Your ratio will be 1.5:1. The jaw and forehead will be the same size (give or take a few millimeters) without being overly pointy or square. Square: Your ratio will be 1:1 or possibly 1.5:1. Your forehead, jaw and width measurements will be the same and your jaw line will be angular (if it is softer and slightly round then look at round face shape). Your features will also be more angular. Rectangle: This also goes for Oblong face shapes. Your ratio will be 1.5+:1 and your jaw and forehead will be equal. 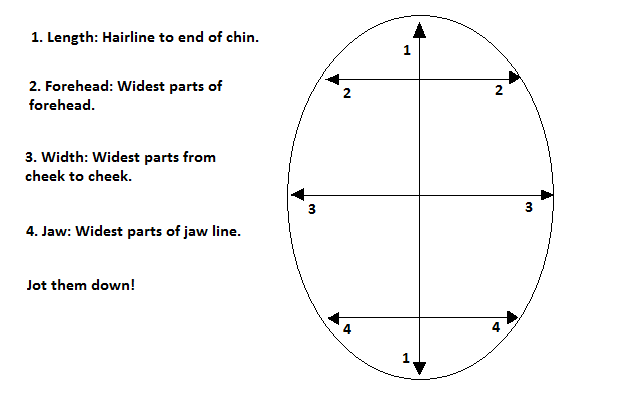 To differentiate between oblong and rectangle we look at the roundness of the hairline and jaw, if it's more square than round you're rectangle, if it's more round than square you're oblong. Inverted Triangle: Your ratio is most likely 1.5:1 (your width may even be a little less). Your forehead will be significantly longer than your jaw and the angle from your cheekbones to the tip of your chin will be fairly straight and angular. Round: Your ratio will be 1:1. Your forehead, width and jaw will be the same length with a roundness to all sections. Your features will also be softer. 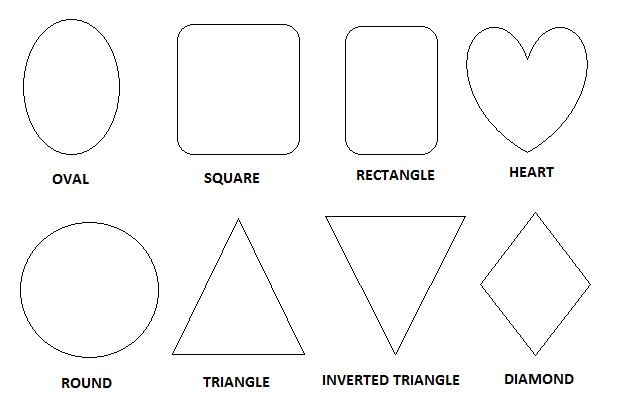 Triangle: This is also similar to a Pear shape. Your ratio is most likely 1.5:1. You will most likely have a strong and square jaw line which will be significantly longer than your forehead, your cross section width will be wider than your forehead but shorter than your jaw. A pear shape will be similar except your jaw and cross section width will be about the same with your forehead smaller and a roundness or softness to the angles of your jaw. Diamond: Usually a 1.5:1 ratio but could differ. The main aspects of discerning this shape is your jaw and forehead compared to your cross section width. Your jaw and forehead should be about the same length but shorter than the width. I was comparing the wrong section for square. Derp. Double check your results! 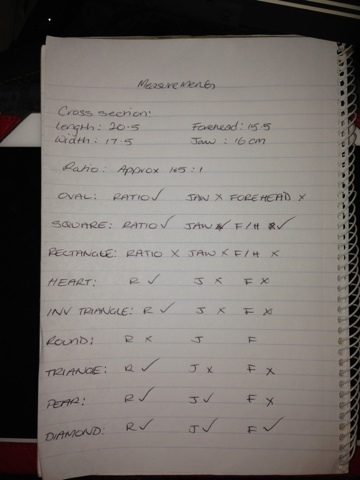 Now as you can see with my results I have 2 shapes fully ticked, square and diamond, this is because my measurements could fit both and this might happen with you too. I know I'm not a typical square because my forehead is slightly rounded, my chin has a little point and my width isn't quite the same as my forehead and jaw but I also know I'm not a typical diamond as the difference between my measurements isn't great enough. So I'm a bit in between, I have a bit of squareness to my jaw but my chin gives it extra point, my cheekbones make themselves known and my forehead is bigger than I like, although I'm not a typical shape, I know a lot more about my face shape and this is key to understanding how to customise your highlighting and contouring to your own face. Being in between is actually pretty normal and not having a distinct face shape is fine! Remember it's just a guide to help you understand what is going on up there a little better and having this knowledge will help you when we take a look at next weeks installment: Corrective face shape techniques (Contouring and Highlighting). So keep an eye out for my Beauty Breakdown posts, some will talk about facial features and identifying your particular type of features, others will talk about products or tools, how to use them like a pro, how to cheat with them, the basics and essentials, how to make the dodgy ones work and getting the most out of them. Did this help you to get an idea of your face shape? 2 comments on "Beauty Breakdown - Identifying Face Shapes."